SUNRISE, Fla. (AP) — Only 25 seconds after nearly ending the game, Mike Hoffman made sure it was over. Hoffman hit the post at 1:03 of overtime and then scored at 1:28 to give the Florida Panthers a 4-3 victory over the New Jersey Devils on Monday night. 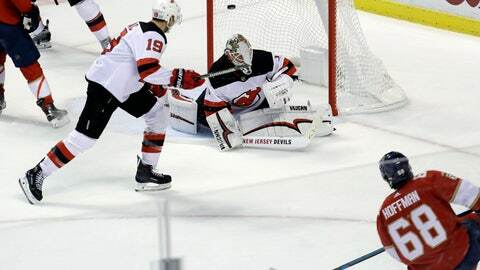 The initial shot by Hoffman was originally ruled a goal before it was quickly overturned after a replay review. Hoffman came back just seconds later with a drive from the right circle that beat Keith Kinkaid, giving him 23 points in his last 20 games. With their goalie pulled for an extra skater, the Panthers tied it 3-all on Jonathan Huberdeau’s 100th career goal with 1:29 left in the third period. Huberdeau also had two assists. Aleksander Barkov added a goal and an assist, and Jared McCann also scored to help Florida halt a three-game losing streak. James Reimer stopped 29 shots. Jesper Bratt, Blake Coleman and Miles Wood scored for the Devils. Kinkaid made 30 saves, and Sami Vatanen had two assists. New Jersey lost its third straight game and is 0-4 in overtime this season. Bratt gave the Devils a 3-2 lead when he tipped in a shot by Vatanen with 8:33 remaining in the third. The goal was Bratt’s second in two games. With the Panthers’ net empty, Huberdeau grabbed a loose puck in front and pushed it past Kinkaid for his 100th NHL goal. Florida closed to 2-1 on a 5-on-3 power-play goal by Barkov, who one-timed the puck past Kinkaid at 7:31 of the second. The Panthers tied it at 2 on McCann’s goal. McCann’s shot from the slot got past Kinkaid and went high into the net with 8:17 left in the second. The Devils took a 1-0 lead on Wood’s goal at 1:23 of the second. Vatanen took a shot from the point and Wood tipped it past Reimer. New Jersey stretched its lead to 2-0 on a short-handed goal by Coleman. Barkov lost control of the puck in the neutral zone and Coleman scored on a breakaway when he put the puck into the corner of the net at 6:01. NOTES: Panthers D Mark Pysyk played in his 300th NHL game. … Florida G Roberto Luongo, who injured his knee in a loss to Carolina last Friday, skated before practice and remains day to day. Devils: At Washington on Friday. Panthers: Host Anaheim on Wednesday.